Innovative and well-connected communication system is a necessity for any organization. B2BCOMZ is a strongly reputed name within the telecommunication industry that not only provides but ensures a high standard of office phone systems and technology. Our varied product line includes a diverse range of business phone systems integrated with latest technological features. Ipecs phones from B2BCOMZ can boost your business performance through an effective communication line. This IP telephony integrated with sophisticated voice and multimedia capabilities can save time and effort by simply easing the business operations. 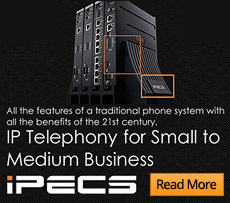 Fully distributed ipecs phone from B2BCOMZ can provide a seamless communication solution for your small to mid-size business. At B2BCOMZ, we pride ourselves on delivering a comprehensive corporate solution for company’s and organizations that are tailored to their diverse communication needs. Innovative yet easy to use telephony systems are flexible to meet the ever evolving technological advancements. Make a wise investment for your business and reap its long-term benefits. We also supply wireless data connections, voip phone systems, T-suite, internet and data services.